Set in the tranquil Nasserein area, Eden Rock is only a few minutes walk to the closest ski lift and approximately 10mins walk into town. Chalet Ariane looks over St Anton’s centre with southerly views over towards Hinter Rendl and up towards the Galzig ski area. For the keen skiers the Nasserein gondola effortlessly whisk you up to the extensive Arlberg ski area. This apartment is part of the Eden Rock project which has been a dream of an award winning architect. He wanted a mix from his local heritage but with an eye to the luxurious properties he had seen and stayed in. 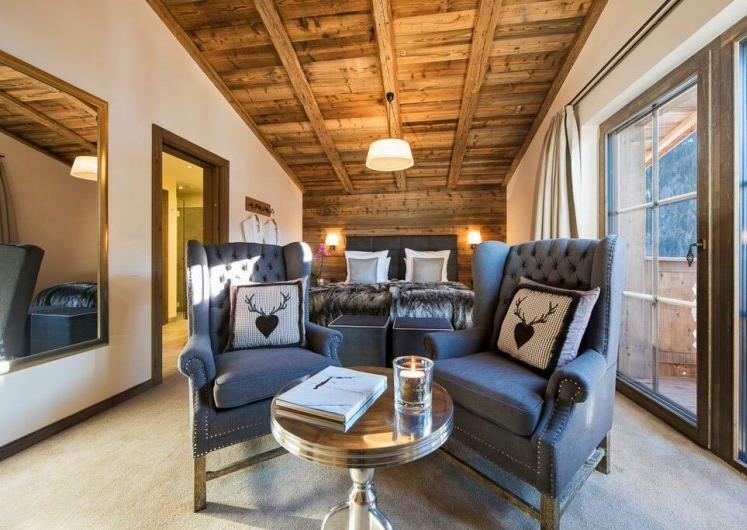 This stylish design delivers everything you could want from a luxury ski chalet in St Anton. One of the things that hits you in Chalet Ariane is the size of the rooms. With one room on the ground floor and two on the lower ground floor each will have plenty of room to spread out and enjoy your time together with friends and family. Each room has a large ensuite bathroom with a separate shower and double sinks. Your sitting and dining area look on to the balcony with mountain views. Enjoy a hearty breakfast in the morning or relax prior to your delicious 5 course dinner served by your chalet team. 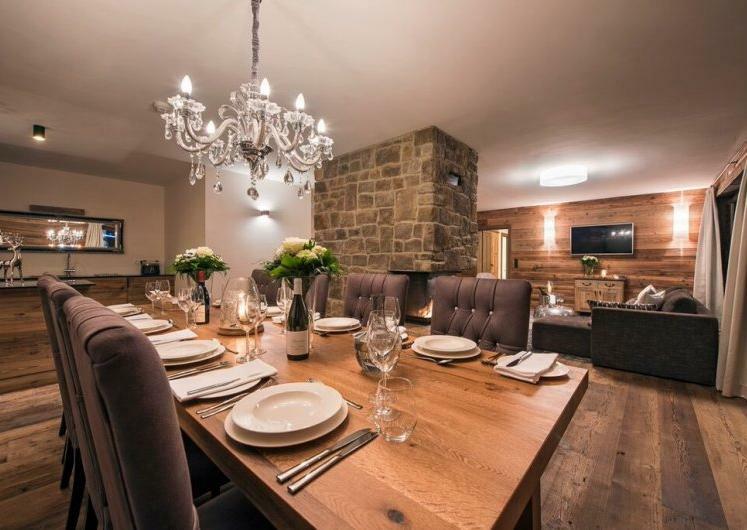 For your pre dinner drinks we will have the real fire crackling away or why not take advantage of the Apple TV linked up to the large flat screen TV as you recline on the comfy sofas in your Alpine surroundings. A highlight of the property is the luxurious wellness area located in the lower part of the building. All our apartments in Eden Rock have access to the spa where you can be as energetic or as relaxed as you wish. With a fantastic pool with whirlpool and a counter current so that you can swim in an endless water stream. Loosen up those legs in the steam room or sauna after your day hitting the slopes or dancing at après ski. For those still with energy to burn you can warm down in the fitness room. Price is based on exclusive use of the chalet to include full gourmet catering, open bar and in resort chauffeur service. We've thought of everything, so you don't have to. Well that's certainly or aim. 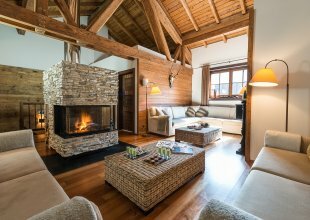 To ensure your ski chalet holiday is as complete and luxurious as you could wish for. Before you arrive in resort, our dedicated team can pre-book any equipment hire or ski school you may need and pre-order your lift passes, saving you the hassle. As for all-important lift access, most of our chalets are either on the slopes or very close to the lifts, but we also run a complimentary vehicle service (Courchevel and St Anton) between 8-10am and 4-6pm, to maximise your mountain time and help you around town when in your ski boots. Every one of our chefs, cooks and hosts are passionate about food and wine, and undergo rigorous training before the start of every season, meaning you’ll tuck into delicious cuisine at every meal. For kids, we can arrange for experienced English-speaking nannies to come to your chalet, day or night. Our helpful sales team are also happy to arrange any other special requests from unusual dietary requirements to restaurant bookings and birthday cakes. We can help arrange additional services, the small touches make all the difference. Your resort transfers for example can be arranged to suit your needs: whether it’s a shared taxi, a private car or if you wish to push the boat out a helicopter. Whatever you desire for the ultimate ski holiday, we are here to assist. Flights and transfers can be sourced with a partner company, please enquire for further information.